I've got my Fishpond Nomad net attached to my wading staff wrist band. Not a real big net, but this has been working out good for me. I have it adjusted so when I'm walking the net is about 10 inches off the ground. I'm not sure if this was posted already or if it belongs somewhere else but mods- feel free to move or delete if I'm covering a topic that has already been beaten to a fine pulp. This past year, my dad and I have struggled with finding the best way to secure our nets. We usually end up shoving the handle down our wading belts as we both have sling packs. I've messed around with the magnetic cords to keep the net a bit closer after I use the net but have found when I go to re-attach the net to the magnet and clip on my pack, it's not that easy to connect and usually end up just using the tether to make sure my net doesn't stray too far. I've been looking into gear retractors and have found a few that seem to have the pull strength to retract my net but I'm slightly hesitant to try one out. Plus it's basically the end of the season so I wouldn't be able to really give it a shot until spring. Does anyone have experience with using a retractor/zip to keep their net closer? If so, which one and how's it been working for you? I have posted this before but perhaps it is time to do so again. I have a somewhat complicated method that works for me and solves several problems with carrying a net. I rig my net so that it has a magnetic release at the end of the net hoop and not the handle. So my net hangs handle side down and makes it easier for me to grab. Next I have a velcro and neoprene band that I put around the handle to hold the net bag tight to the handle. 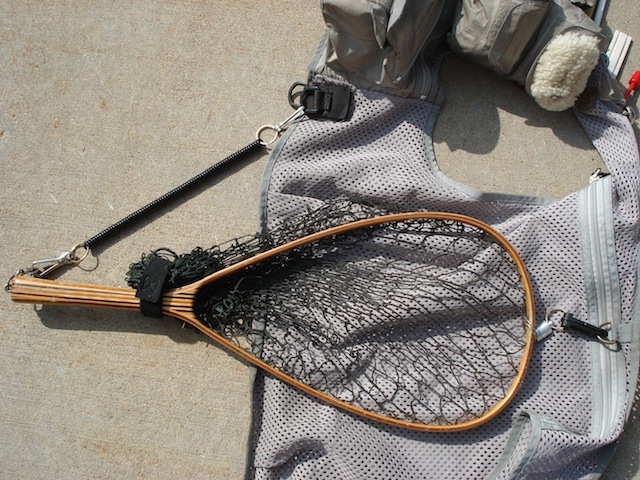 It keeps the net bag from flopping around and getting caught on bushes and tree limbs. If the net bag happens to catch on a branch, it will pull off the magnetic release and the net will fall. If you are along the bank next to a fast flowing river, it can fall into the water and you will lose your net. With the C&R shallow rubber bags, no net bag strap is needed. I bought this net bag holder but they are not made anymore. However, you can make your own neoprene bag holder. Take an old pair of neoprene waders and cut a one inch wide strip of neoprene. Take one end of the the neoprene strip and loop it around forming a circle smaller than your net handle and sew the loop closed. Cut a piece of the hook side of velcro fabric that is one inch by one inch. This will be the velcro that will hold itself to the fabric of the neoprene. Place the loop of neoprene around your net handle, grab your net bag, and stretch the free end neoprene band around the bag so that it hold the bag to the net handle. Mark the neoprene band where you want the velcro, but remember to leave enough extra neoprene in the band so that the bag will not get trapped under the velcro. My band measures about 3 inches. Sew the velcro in place. Leave about a 1/4 inch of free neoprene next to the velcro and cut the rest off. This will be the edge you grab to release the net bag. If you don't want to make a net bag holder, you can substitute a thick rubber band around the net handle to hold your net bag. Finally, I have a spiral retractable safety cord attached to a ring screw in the end of the handle. The other end of the cord is clipped into a "D" ring that has a piece of velcro sewn to it. The velcro is the hook side. The loop side of velcro is sewn to the bottom left side (I am right handed) of my fly vest. I hook the two velcro pieces together. So my net is attached to the net ring of my vest with a magnetic net release. The net bag is kept under control by the neoprene bag holder. The handle of the net is attached to me vest by a safety cord. When I need the net, I pull on the net handle with my left hand releasing the net, and I pull the net bag from under the neoprene band. If the fish makes another run or I need my left hand free to pull in line or reel in line, I can just drop the net and it is still attached to my vest by the safety cord. I can just grab the handle again when I need the net again. After releasing the fish, I never have to worry about forgetting the net on the river because it is attached by the spiral safety cord. If I want to lend the net to someone or take a photo of a fish in the net on the river bank, I just pull the velcro D ring off of my vest. The magnet release reattaches itself by automatically when I place the end of the net close to the vest net holder and I am ready for the next fish. I have several nets are rigged the same way and I can clip the spiral cord to the handle and they have the same magnetic release so all my nets will hang in the same way match the magnet on my vest. This system may sound complicated but once it is set up, it solves many of the problems of losing your net in the river, needing a free reel hand once you have grabbed the net, and removing the net. It has a magnetic release on one side and a safety cord with a velcro release on the end of the cord. I think you can adapt the system to a sling pack by putting a D ring and magnetic release on it. The velcro end can be put on a wading belt. I've got a few points that I could attach the net to my sling or to my belt. I've got a Fishpond Thunderhead sling which has a built in slot for the net handle so when I'm walking out to where I'll fish, it'll most likely be there. When I'm in the water is where the zinger will probably shine the most by keeping it away from my legs so I don't get caught up when I'm walking or getting back up on the bank. I have a few similar zingers to the one you shared and they're great for nippers and forceps which got me thinking about using one for my net. This might be cumbersome but what about getting a cheaper carabiner from sierra trading post or somewhere like that and attaching that to the wading belt instead of the loop on your waders. Then you could attach your retractor to the carabiner instead of the loop? Another fan of the Smith Creek net holster. I have lost too many nets in the past and got sick and tired of it. This past year using the net holster, I still have my net. For me, it depends what (size) net I'm carrying and what gear I'm using. With a (bigger) Rising net, I didn't like a magnetic connector because the handle of the net kept smacking my legs when walking. When using a backpack style vest, I just use 2 pieces of velcro spaced apart on my pack to create a "holster" for the net (see pic below). If I'm using a lumbar pack, I just run the net between the pack without a holster. In this case I usually carry a fishpond net that is lighter and has a slightly shorter handle than the rising. That's one way I'm considering to hold my net also in my sling while I'm walking to the water. Then I'd probably rely on the magnet or retractor to keep the net close at hand. Thanks. It took some work (SportDog remote training collar was a savior), but she's matured into quite the fishing partner. Must be interesting taking your heeler fishing if he/she doesn't like you near the water! For what it's worth, I don't find it overly difficult to get the net out when strapped onto the pack. It was a bit awkward at first, but now it's just a single quick motion and that net is in my hand and ready to scoop. However with the net sliding in/out on the pack, it does cause some additional wear-and-tear on the pack itself. I would definitely buy another if it went down. I did have to add some small carabiners to get it to function the way I wanted, but they were less than $1.